Last week I had a satisfying political experience that I wanted to share with you. Our Governor, Charlie Baker, was set to sign into law a bill that would offer licensure to naturopathic doctors in Massachusetts. Since I’ve benefitted from sound naturopathic medicine – the kind of care that focuses on prevention and that treats the whole person, I was in favor of the passing of the bill. When I heard it was up for approval again (after two decades of trying to get it passed), I was inspired to take action. I educated myself on the issue. I emailed the Governor’s office. I called to record my position as a citizen. I donated money to the organization supporting the bill. I held the intention of seeing it pass. The day the Governor would decide on the outcome, I received incorrect information that it had not been passed. I was disappointed and frustrated, but I also felt empowered because I had done something to contribute to the result I wanted. Later that afternoon, I discovered that the bill had, in fact, been signed. I was so excited and grateful not only to have legitimate access to a form of healthcare I find valuable, but because in some small way, I had done my part to help make it happen. What if my email, phone call, signature, or intention had been the action (or actions) that sent the issue over the edge? While this seems unlikely, the reality is something creates a tipping point. I’ve thought about this experience all week. It’s so easy to feel helpless and small when it comes to big issues. Will my vote really matter? Does anyone even record my call? Can writing an email or letter actually have an impact on the issues that matter most to my family and me? In the end, the answer is yes. 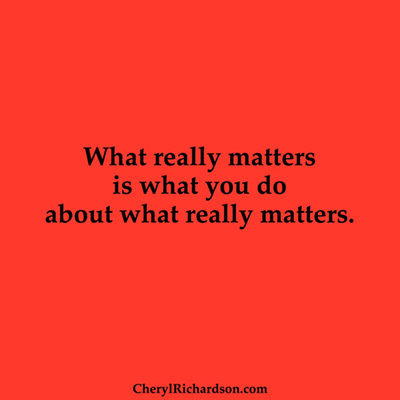 What really matters is what you do about what really matters. Someone posted this video on Instagram this week and it melted my heart. I could completely identify with this little girl, can you? Check it out here.